Indiana Jones and the Infernal Machine was the first game in the Indiana Jones series to be presented as a 3D third person perspective action-adventure game. 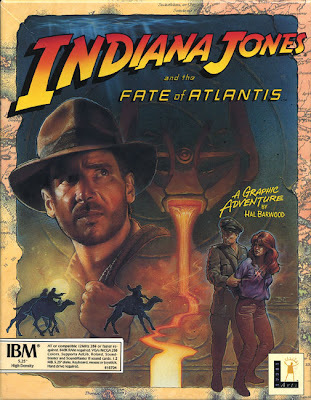 It is a direct sequel to the adventure game Indiana Jones and the Fate of Atlantis, taking place years after that game. World War II is now over, and Sophia Hapgood now works for the Central Intelligence Agency. She and Indiana Jones work together to stop a plot by the Soviet Union, led by a scientist researching alternate dimensions, to find a supernatural weapon that is said to be more powerful than an atomic bomb. It was released for Windows on November 23, 1999 and for Nintendo 64 on December 15, 2000. The March 23, 2000 Game Boy Color release of the game was a 2D side scrolling action-adventure.